Yes, homebuilding is addictive. This lowracer is my third bike. 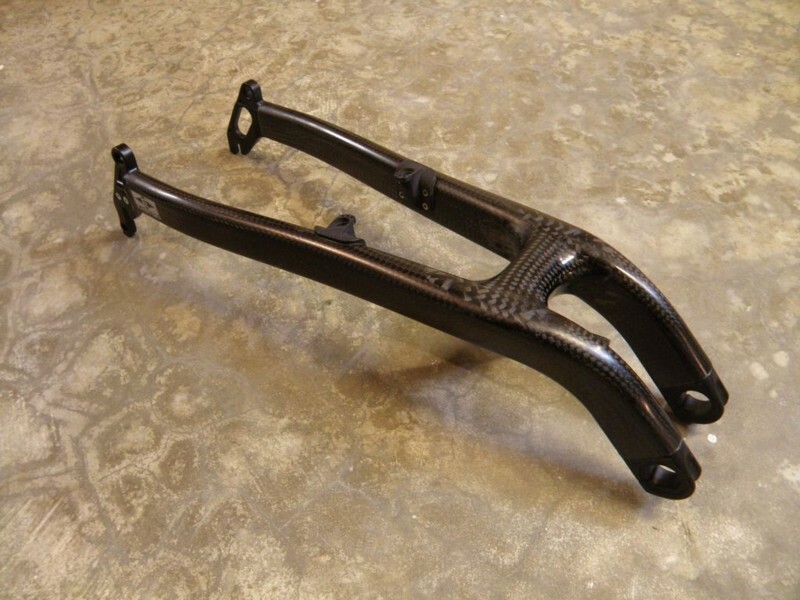 The story of this bike really started with my purchase of this carbon fiber swingarm in 2007. But at that time I had no clear idea of what kind of bike I wanted next. 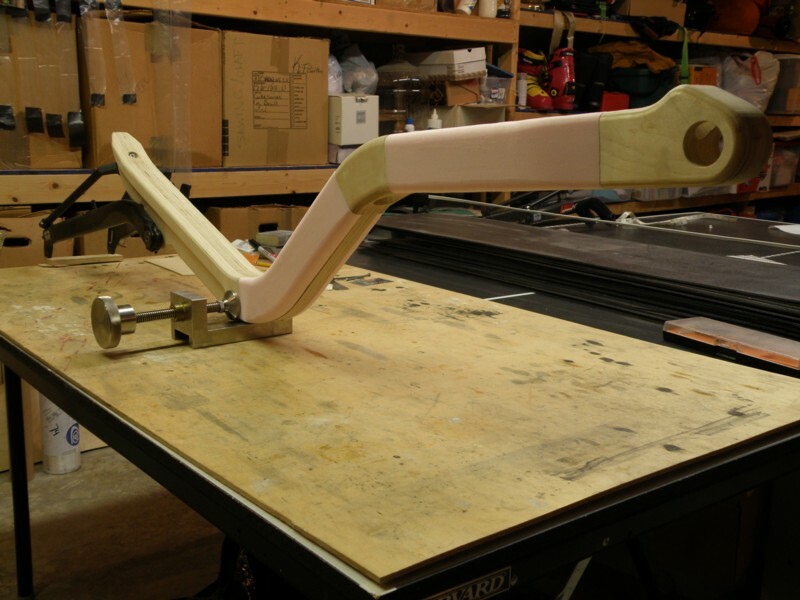 And for several years this swingarm sat in a drawer in the basement. As time went I started thinking more and more about the idea of a lowracer. This is my Lowracer plan. The basic strategy was similar to that of my previous "Mistress". 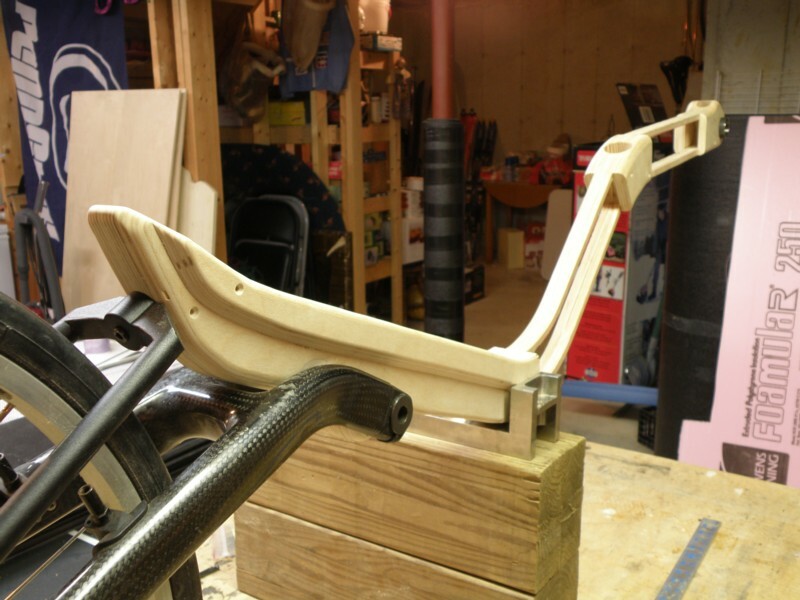 Again I planned to use a hollow wood frame reinforced with carbon fiber, combined with a mountain bike swingarm. But there were to be some differences. Of course, since it was to be a lowracer, the seat would be lower, the wheelbase longer, and the seat more laid back. In addition, I had a K2 Proflex carbon fiber swingarm to use instead of the aluminum Walmart job I used on the Mistress. 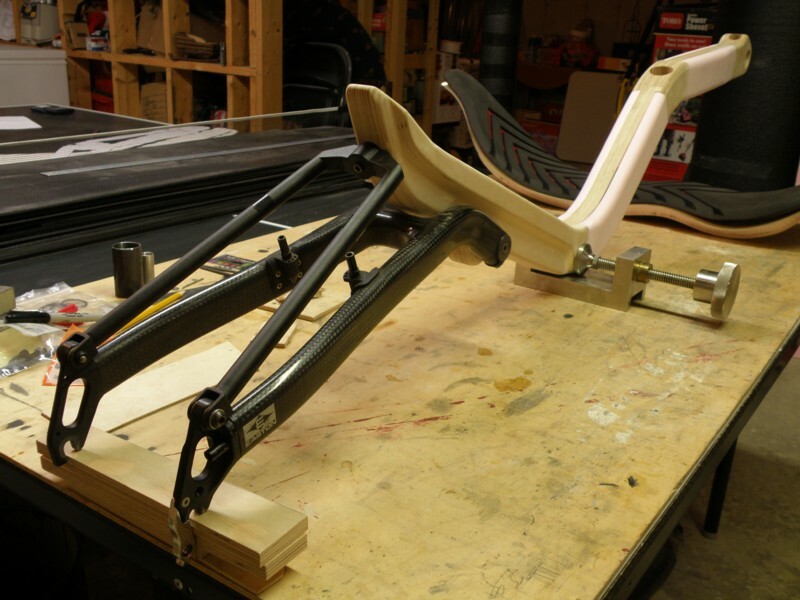 Further, the subframe was to be made with polystyrene foam in place of wood in some areas in order to minimize weight And, the seat would be separate from the frame, in order to allow the possibility of adjustment. 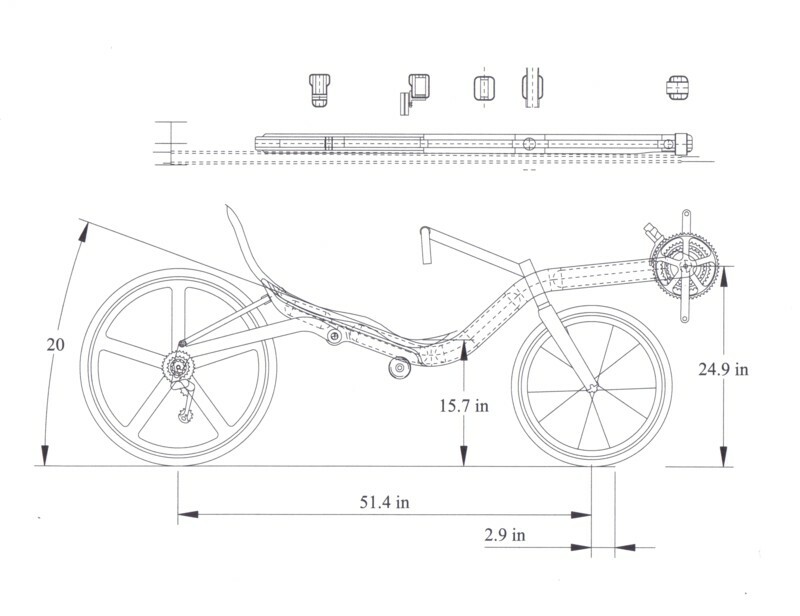 The drawing above is not actually the original plan, but shows the bike essentially as made. The main difference is the front wheel size. I originally planned to use the Barcroft fork that I had previously used on the Mistress, which was made for a 406 wheel. But later I found a nice carbon 451 front fork on the Performer website that I decided to use instead. The change had a pretty significant impact on the trail: I had planned for about 1.5 inches, but with the bigger front wheel it ended up being almost 3 inches. I printed some copies of the drawing full size, glued them to posterboard and cut them out to make templates. 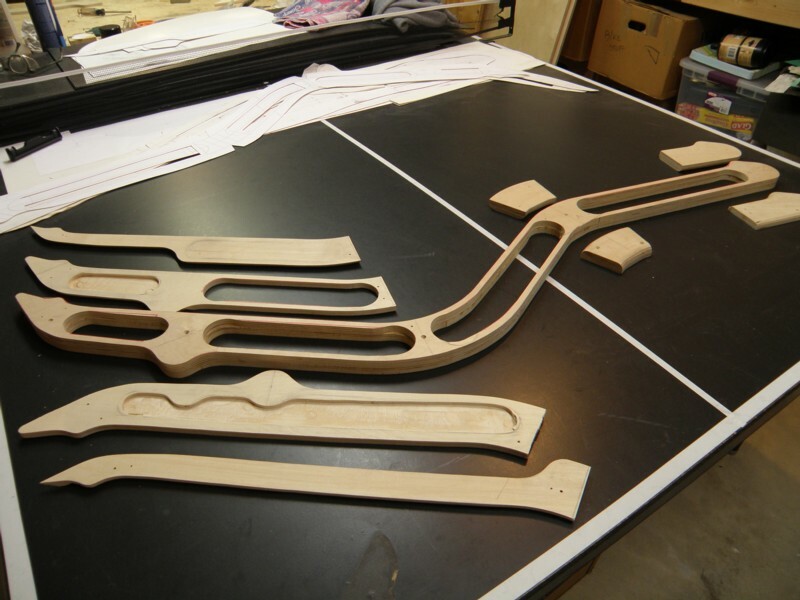 I traced the templates onto the plywood, then roughcut the perimeter of each piece using a Dremel Trio. This worked better than the sabre saw I used previously. 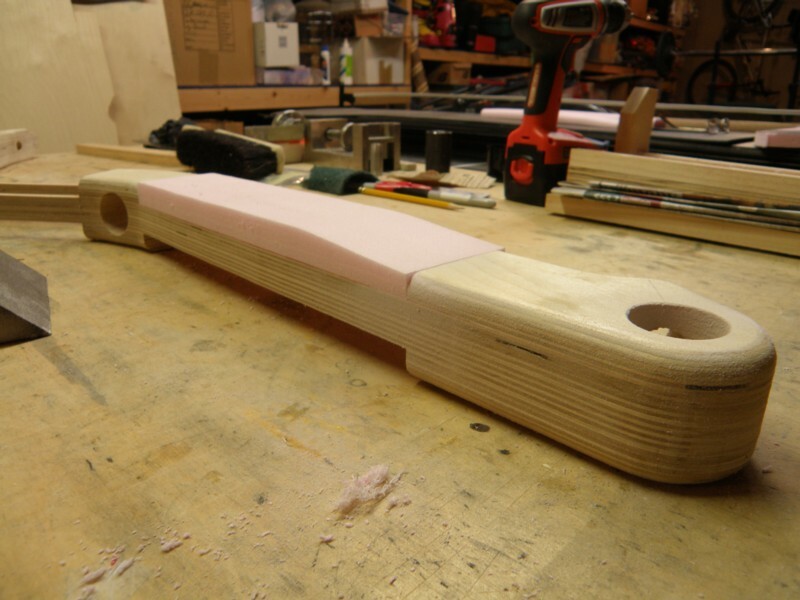 For the slots, I used a hole saw at each end the used the Trio to make the connecting cuts. For the final shaping, I screwed the pieces together and sanded the edges using a drum sander attachment on the drill press. 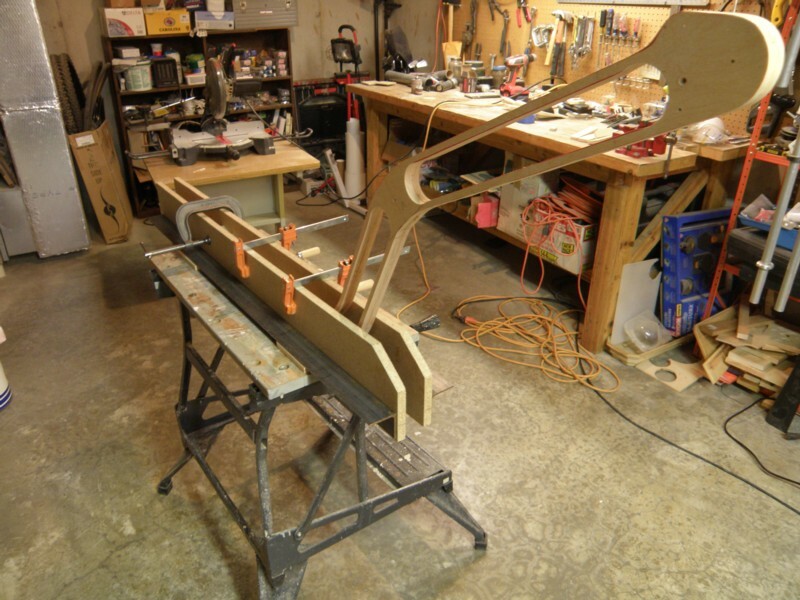 I glued the plywood sections together using wood glue and clamped them in my workmate while the glue set. I used Forstner bits to drill holes for the front derailleur tube (shown above) as well as for the bottom bracket, head tube, swingarm mounting points. After drilling all the holes, I attached the swingarm temporarily to see how it all fit. Just right. Above is another view of the test assembly. 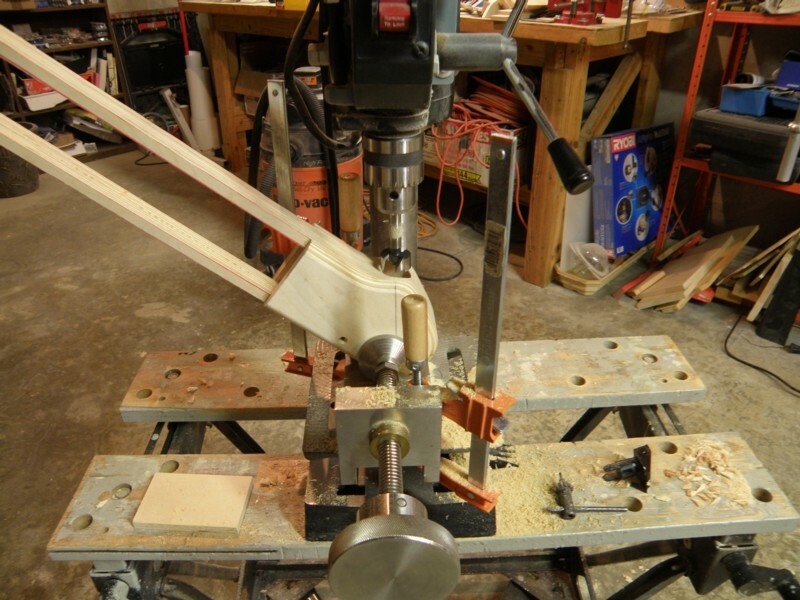 The holes in the wood are from the screws that held the pieces together during sanding and clamping. After the glue set I removed the screws. Next was to fill the gaps in the front two thirds of the skeleton with polystyrene foam. 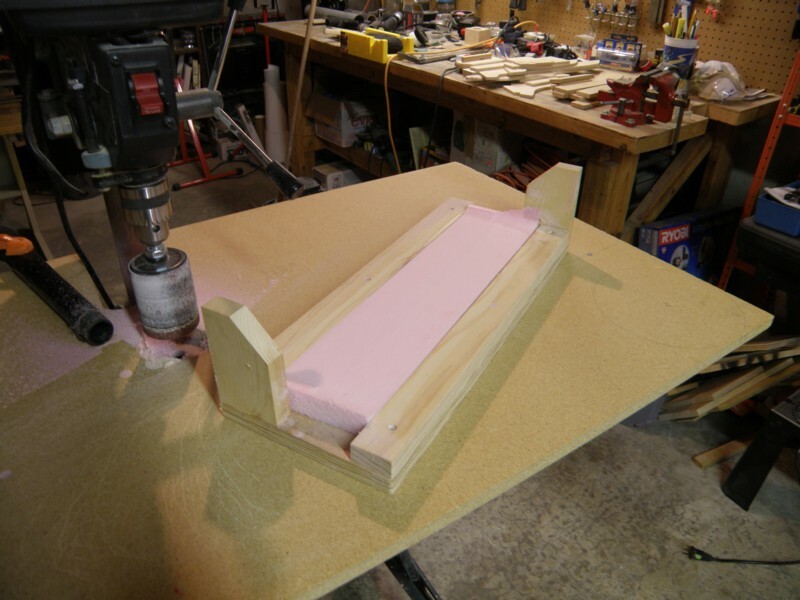 The foam was one inch thick as purchased, but needed to be just under 3/4", so I made a jig to help me sand it down. Here's the first piece after it's been cut to size but before final shaping. 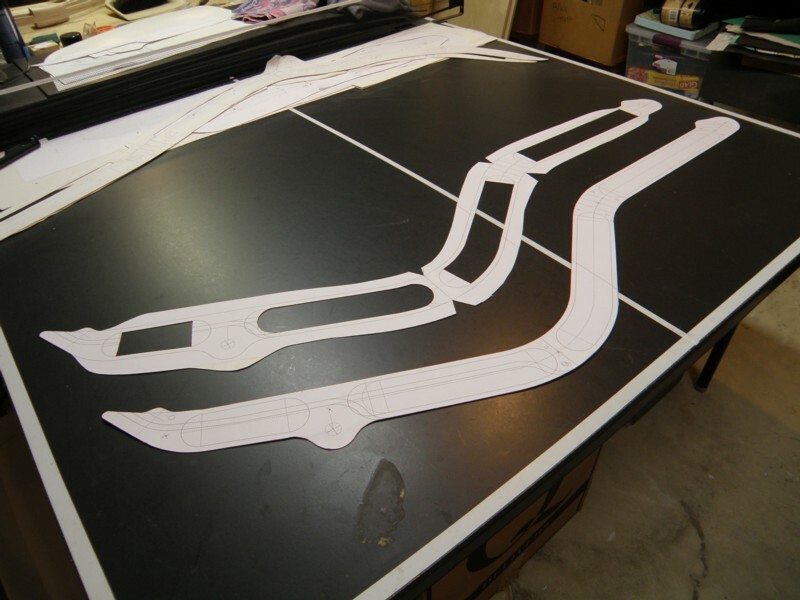 Here all four polystyrene foam pieces are finished and held in place with spray adhesive. 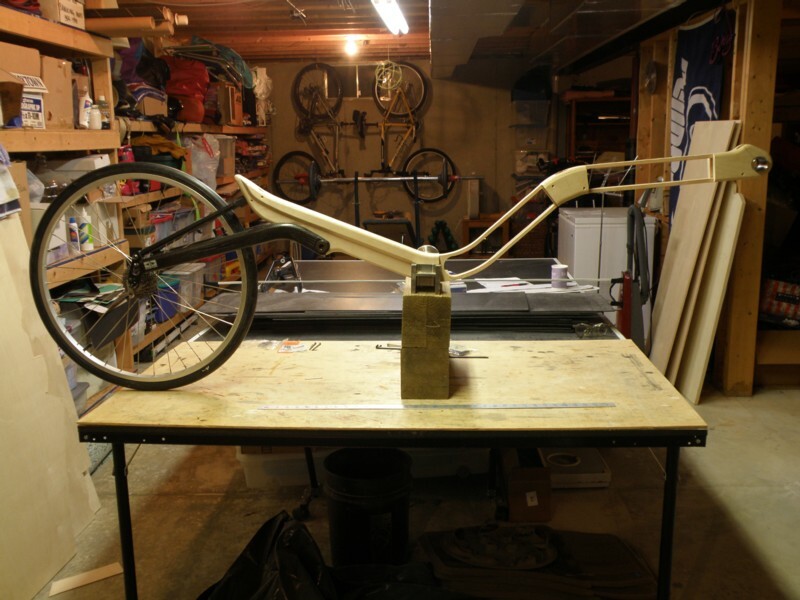 In this image you can also see (but maybe not too well) where I added some wood filler on the rear of the frame to smooth the transition from the wider section on top to the narrower section below. The filler is lighter in color. 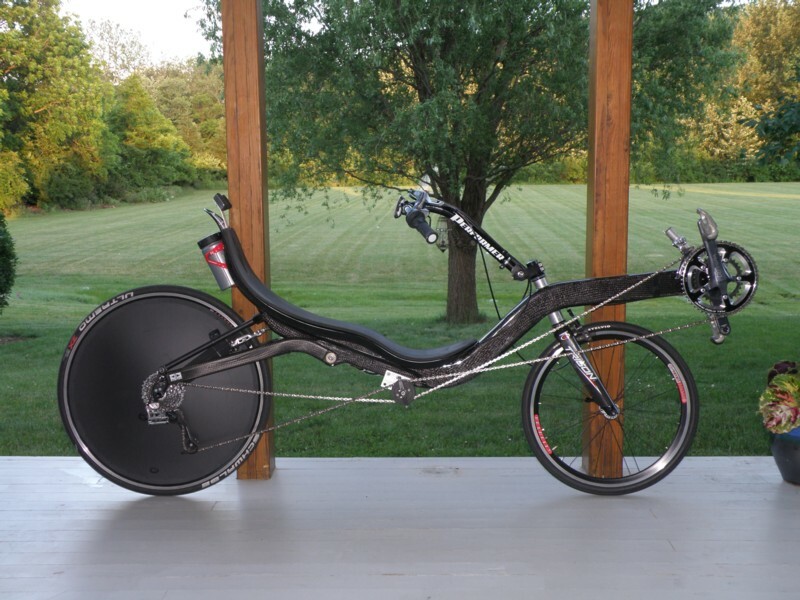 My purpose was to help the carbon fiber layers conform more easily and without wrinkling. Completed substructure, from the front. And from the rear. 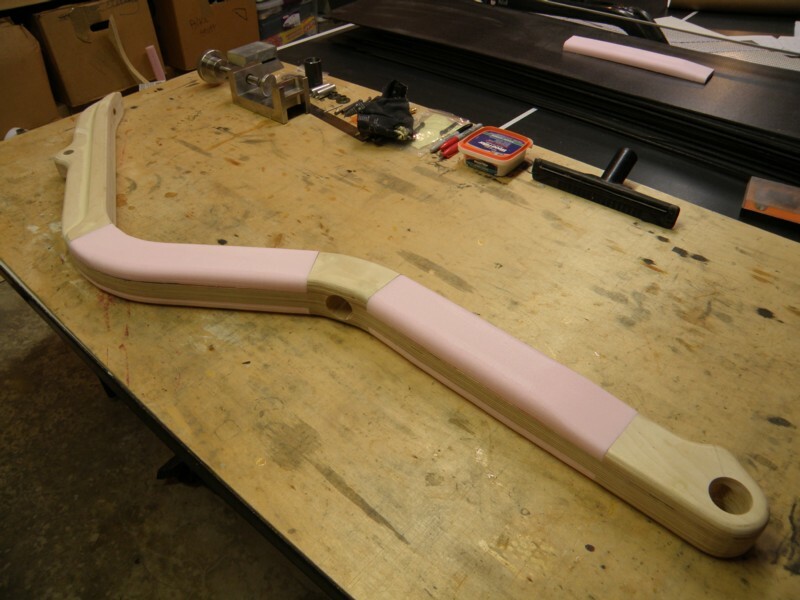 Next, it's time to start adding the carbon fiber layers.